At the beginning of August, ESVAGT took the opportunity to invite visitors in for a sneak preview behind the facade of their new, almost completed, premises during the Tall Ships Race in Esbjerg. 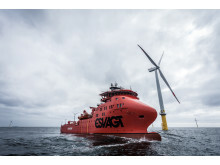 ESVAGT and Vestas have a very good cooperation in servicing the wind farm Blight Bank in Belgium. The cooperation was further strengthened on a teambuilding day, where the crew from “Esvagt Supporter” was invited to participate. The HSEQ programme 2014 has identified potential areas for improvements: More of all of it – only not CO2. ​Jesper Møhring Madsen has been relieved from ‘Esvagt Bergen’ after being appointed HSEQ Manager in ESVAGT after nearly 20 years at sea. One of the three founders of ESVAGT, Ole Andersen, has been chosen as Citizen of the Year in Esbjerg – for the work he has done in the shipping company among other things. He himself finds that there are others who deserve the title more than he does. ESVAGT has re-designed the organisation to increase efficiency and ensure continued optimized services.